Lebanon launched a bike-sharing programme in its capital Beirut on Sunday, hoping to cut down on the congested city's notorious traffic and pollution. The scheme aims to eventually allow users to rent and return bicycles at 25 automated stations distributed across the city. For now, a single station is operating in central Beirut, with limited cyclist lanes available to those looking to beat the traffic. 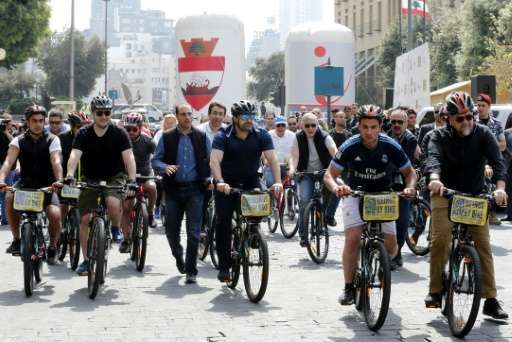 Prime Minister Saad Hariri officially inaugurated the scheme, participating in a bike ride and pledging to organise car-free days to prioritise cycling in the city. Around half a million cars clog Beirut's streets on a daily basis, according to experts, causing enormous traffic jams and contributing to air pollution. But only a handful of cyclists brave the roads, where drivers regularly ignore traffic signals and lanes are virtually an unknown concept. The bike programme has already started in the northern city of Byblos, and there are plans to expand it to other coastal cities, including Tripoli and Batroun in the north, and Sidon and Tyre in Lebanon's south. The scheme will charge around $3 an hour for bike rental, with monthly subscribers paying a lower rate. Bike-sharing programmes have proved popular in many major cities, including Paris and London.